Monday UPDATE UPDATE: How 'bout it, Ride Along actually went up $400K with Monday's actuals but poor little Jack Ryan dropped nearly $2M, as the CIA operative's return can be classified as underwhelming at best, franchise-killing at worst. Sunday UPDATE: Record smashed. Cloverfield got kicked to the curb by Kevin Hart and Ice Cube over the weekend as Ride Along drove off with a new January record, putting the pedal to the metal with its $41.2M debut. So where did all that cash come from? Females took up more than half (57%) the seats, with African American and Hispanic audiences accounting for 80% of total tickets sold. Other newbies included an outperforming The Nut Job and a tepid Jack Ryan: Shadow Recruit, whatever plans Paramount had for restarting that franchise appear to be stalled out. Now this is a free for all. With four new releases and one strong holdover, this is one of those January wild card weekends where you could easily see my number two – or even, three – film pop to the top as gauging interest in any of the newbies is an inexact science at best. Being a holiday weekend only adds to the chaos as we are also set for a couple of really, really big football games on Sunday. With that in mind, these are my "best guesses". 1. 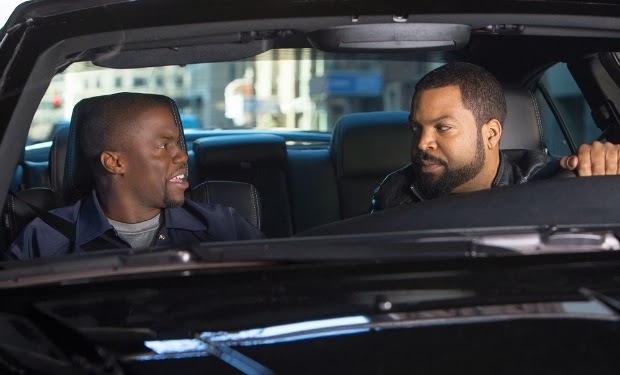 Ride Along $30M (↓) – Kevin Hart's coming out party; can the comedian carry a feature that doesn't have him standing on stage with a mic? 2. Lone Survivor $24.75M – A+ CinemaScore portends a strong hold for Peter Berg's highly-watchable war drama. 3. Jack Ryan: Shadow Recruit $17.5M (↔) – When is Chris Pine going to cement his status as a true box office draw? The staying power of Lone Survivor doesn't help things here. 4. The Nut Job $15M (↔) – Subpar animated offering serves as a placeholder until The Lego Movie crushes hellacious cash. 5. Devil's Due $13M (↑) – Shaky-cam horror returns just weeks after the underperforming Paranormal Activity offshoot.